Industry body DairyNZ says the increased dividend and the maintained $4.25 per kg MS Fonterra Farmgate Milk Price is some good news for farmers with shares. But another positive is also emerging – New Zealand dairy farmers have sharpened their systems and reduced costs through this sustained low milk price period. DairyNZ chief executive Tim Mackle says while the milk price will continue to keep pressure on farmers this season, the industry’s performance in cost-cutting on-farm means break-even costs have been reduced. . .
New Zealand’s meat processors have for some years collected a single uniform biosecurity levy on beef and dairy cattle at meat processors to pay for the costs of TB eradication. Following a review undertaken last year, the Government and DairyNZ agreed that dairy farmers shall pay for a greater share of their share contribution to TB eradication via a differential levy paid on dairy cattle at meat processors. Meat processors opposed this differential levy on dairy cattle at meat processing. Meat processors believe that it is contrary to good public policy for costs to be charged at the point of production where they do not arise – in this case, costs incurred by dairy farmers should have been met by a charge on their dairy production, rather than through a complex system of differentiating dairy and beef cattle at meat processing. 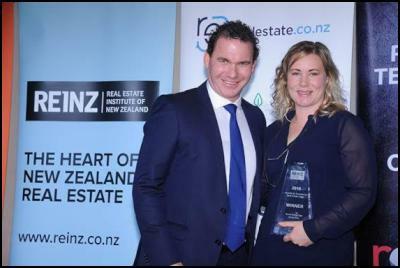 . .
Katie Walker accepts her award from Brennon Skipper (CEO of realestate.co.nz). A new report into New Zealand’s tourism sector says travellers are looking to regional New Zealand for a more ‘authentic’ Kiwi experience. In its latest report on the tourism sector, consumer behaviour analysts Marketview has looked at the spending patterns of tourists around the country, and Managing Director Stephen Bridle says the results mean good news for regional New Zealand. “Our figures show confident, independent tourists want unique and authentic experiences centred on specific interests. Those here for cycling, golf, fishing and even shopping can find something uniquely Kiwi almost anywhere in the country.” . . Significant rises in New Zealand carbon prices and positive prospects for exported timber may signal a renaissance for forest plantings, with new opportunities for landowners and investors alike in coming years. Since April the value of carbon prices in New Zealand have almost doubled to $18/tonne after languishing as low as $2.50 a tonne only two years ago. Meantime log prices have remained relatively firm, sitting $15 a tonne above their five year average with some strong price signals over the past year coming from traditional markets including China and increasing market share to India and South Korea. As of May export values were up 6% in value on a year to year basis. . .
New Zealand farmers and growers have been exporting food and fibre for over 150 years. Our primary industry export revenue is estimated to reach over $36.7 billion in the year ending June 2016. Over this time innovation and research based science has allowed New Zealand farmers and growers to become world leaders in productivity and quality – with New Zealand well placed to help feed a growing global population. These gains are increasingly at risk due to the politicising of science which is leading to its marginalisation. So arguing for sensible science is one of our industries greatest challenges. . .
Z’s General Manager of Supply and Distribution, David Binnie, said the delivery of tallow was a milestone which has been years in the making. . . Telling the world about Central Otago’s wines and proving to people who sell those wines just how spectacular they are, is the job of Central Otago Pinot Noir Ltd (COPNL). COPNL’s latest group of brand ambassadors flew out of Queenstown airport at the end of last week, marking the completion of COPNL’s tenth iconic ‘E’Sensual’ event. E’Sensual has been part of the Central Otago wine industry’s event calendar each year since 2007, and is targeted at international and national wine specialists who enjoy a first-hand taste of what the region’s wine industry has to offer. The 2016 E’Sensual marked the tenth anniversary of the event and celebrated the 150th E’Sensual guest hosted in the region. . .
(BusinessDesk) – PGG Wrightson shares gained 4.5 percent after it said full-year profit rose about 20 percent and operating earnings beat guidance, which had already been upgraded on the strength of the horticulture and beef sectors. The Christchurch-based company today said trading beat expectations “due to a variety of factors” and that operating earnings before interest, tax, depreciation and amortisation exceeded $68 million in the year ended June 30. Wrightson raised its earnings forecast in June, predicting ebitda of between $65 million and $68 million in the year, though down from $69.6 million in 2015. . .
Prime Minister John Key has announced the government’s goal of New Zealand being predator free by 2050. The Government will look to provide funding on a one for two basis – that is for every $2 that local councils and the private sector put in, the Government will contribute another dollar. This is a BHAG – a Big Hairy Audacious Goal and Conservation Minister Maggie Barry is right when she says it will take a team effort to achieve it. “New Zealand’s unique native creatures and plants are central to our national identity. They evolved for millions of years in a world without mammals and as a result are extremely vulnerable to introduced predators, which kill around 25 million native birds every year,” Ms Barry says. Under the strategy the new government company, Predator Free New Zealand Limited, will sponsor community partnerships and pest eradication efforts around the country. “By bringing together central and local government, iwi, philanthropists, and community groups, we know that we can tackle large-scale predator free projects in regions around New Zealand,” Ms Barry says. The Predator Free 2050 Project will combine the resources of lead government agencies the Department of Conservation and the Ministry for Primary Industries to work in partnership with local communities. Primary Industries Minister Nathan Guy says the goal of a Predator Free New Zealand by 2050 will have major positive impacts for farmers and the wider primary sector. “Possums and ferrets are the main carriers of bovine TB, which is a very destructive disease for cattle and deer. In this year’s Budget the Government committed $100 million towards combined eradication efforts with industry starting with cattle and deer by 2026,” Mr Guy says. Not all the technology to make New Zealand predator free yet exists, and the Biological Heritage National Science Challenge will have an important role in developing the science to achieve the predator free goal. Predator Free New Zealand Limited will have a board of directors made up of government, private sector, and scientific players. The board’s job will be to work on each regional project with iwi and community conservation groups and attract $2 of private sector and local government funding for every $1 of government funding. “These are ambitious targets in themselves, but ones that we are capable of reaching if we work together,” Ms Barry says. “A country free of predators would allow forests, towns and cities to fill with native bird life such as kiwi, kākāriki (parakeets), pīwakawaka (fantails), tīeke (saddleback), kōkako, and kākā. Other species like tuatara, hihi (stichbirds), toutouwai (robins), insects, and native snails would repopulate forests and other wild places,” says Forest & Bird Advocacy Manager Kevin Hackwell. “Reversing centuries of misguided predator releases and their ongoing devastating effect on our native species and habitats will take commitment, investment, and collaboration, but is entirely achievable by 2050, with the right resources, experts, and framework in place,” says Mr Hackwell. We spent five days sailing round the Fiordland coast last year, landing occasionally to see native bush much as it would have been when Captain Cook first saw it in 1773. He would have been greeted by bird song but the bush through which we walked was almost silent. Human and animal predators decimated the bird population and in too many places pests are still winning the battle against the birds. The Department of Conservation is making a concerted effort to eradicate pests and re-establish species like the kakapo. That’s not easy on islands and it is even more difficult on the mainland with possums, stoats, ferrets and rats breeding freely and preying on eggs and young birds. Predator-free fences around bush have been established in several places but the Predator Free New Zealand by 2050 strategy recognises a lot more needs to be done. It also needs to be done carefully with regard to the whole food chain. Rats prey on mice which prey on birds’ eggs. Eliminating rats would not be enough if that allowed the mouse population to explode. It will take a lot of money and a lot of work but it will be worth it if it results in burgeoning bird populations with better public and animal health as a bonus from the eradication of pests which wreak havoc on native flora and fauna, and carry diseases. May Murphy recalls an incident 30 years ago – she and her husband Robin were driving a friend, also involved in dairying, through Ikawai-Glenavy. ”When Robin told him: ‘In time this will all be dairying’ he thought he was joking – but it’s happened,” Mrs Murphy said. Murphy Farms Ltd is run by Mr and Mrs Murphy together with son Bruce and daughter-in-law Lesa Murphy. Bruce and Lesa’s children, Jack (11), Harry (10) Katie (6) and Lily (3) are part of the family firm. . .
Craigs Investment Partners has initiated coverage on The a2 Milk Company with a hold recommendation on the shares given the broad-based nature of growth opportunities. The company will change its name from A2 Corporation to The a2 Milk Company on April 8. Managing director Geoffrey Babidge said the new name ”instantly and consistently” described the values and mission in a way the current trading names did not. ”It reflects our journey from early research and entrepreneurial pioneers in New Zealand to a unified global identity,” he said. Craigs broker Chris Timms said a2 was ”a little bit frothy” but genuine and broad-based opportunities existed for the Dunedin-founded company. . .
Planning for a sustainable future was the focus of a roadshow in Rangiora last week. Rural Women New Zealand’s 2014 International Year of Family Farming roadshow rolled into the Rangiora Showgrounds on Friday to share ”good news stories” about the role of family farms now and in the future. Development and marketing manager Kiera Jacobson said the focus was on family farms being sustainable, ”not just environmentally, but also financially and in our on-farm safety”. . .
A key part of Lincoln University’s remit for the future is ‘feeding the world’ – with significant emphasis on promoting food science and innovation within the national and international food sector. In 2013, the Lincoln University Centre for Food Research and Innovation was established to promote innovation and collaboration with the food industry. Centre Director and Professor of Food Science, Charles Brennan says food science has the potential to not only grow the economy, but also deliver national health benefits at the same time. “Our aim is to create food that is convenient, nutritious and good value. By applying theoretical knowledge to the processing of foods, we are able to meet consumer demands for flavour and texture, as well as nutrition in terms of protein digestibility for human growth, and starch digestibility in relation to glucose levels. Food science and innovation are critical not only to the economic viability of New Zealand, but for the world economy as a whole.”. .
Canterbury law firm Tavendale and Partners and Lincoln University have announced a postgraduate scholarship to support applied knowledge and innovation in agri-tech. The $6500 scholarship will be awarded annually to a postgraduate student studying at Lincoln University and specialising in the invention and application of smart agricultural technology. The first scholarship will be available for the second semester of this year and then annually after that. . . The Princess Royal has injected new controversy into the highly charged debate on the badger cull, calling for the mammals to be gassed in their setts. But her intervention, in an interview with BBC’s Countryfile programme to be screened tomorrow, was welcomed yesterday by some West Country farmers frustrated by the Government’s failure to approve a further roll out of the shooting of badgers as part of the battle against bovine TB. Her comments were immediately condemned by Rosie Woodroffe, of the Zoological Society, who said it was difficult to achieve lethal concentrations of gas in complex badger setts, and by Mark Jones, a vet and the director of the Humane Society. . . . In New Zealand in 1990 the proportion of TB in cattle was about 7 times greater than it was in Great Britain. However in 1997 the proportions were about equal. Currently (in 2011) the proportion in New Zealand is about 40 times less than what it is in Great Britain. Since the early nineties, control of the principal wildlife vector, the possum, in New Zealand has increased whilst in Great Britain since 1986 control of the principal wildlife vector, the badger, has reduced. . . Bovine TB is “out of control” in Wales and cattle measures alone won’t halt the upward spiral of disease prevalence, deputy president of NFU Cymru Stephen James has warned. Figures released by DEFRA yesterday revealed the number of cattle slaughtered in Wales, because of the disease, has risen by 15% to 9,307 animals in the last year. NFU Cymru said this is despite farmers adhering to “draconian” measures such as annual testing and pre-movement testing across the whole of Wales, which impacts heavily on every businesses decision they make. I’m not sure it’s fair to call those measures draconian. Herds in some areas here are subject to annual testing and pre-movement testing to prevent the spread of the disease in high risk areas. However, these measures won’t stop infection from wild animals. Mr James said the figures “hammer home” the fact cattle measures alone were ineffective in stopping the disease. He added: “These figures show a policy that fails to adequately tackle and remove the disease from the wildlife population will never get on top and ultimately eradicate this disease from our countryside; instead the disease continues to escalate. We can be thankful that wild species which carry TB here, such as possums, stoats and ferrets, are introduced and we’re encouraged to cull them.